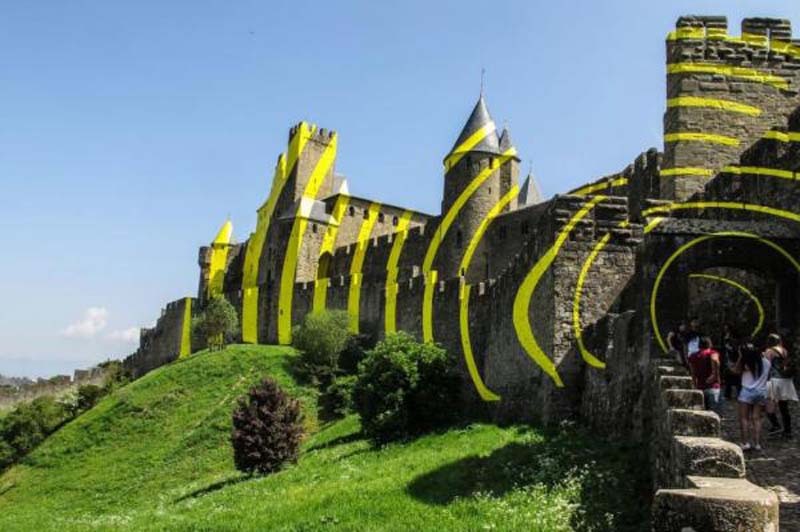 An art installation in the medieval southern French city of Carcassonne features yellow stripes and circles, and is angering residents of the city. The city's signature element and tourist destination is its circular walled fortress. Much it was built in the 14th and 15th centuries but sections date to ancient Roman occupation. It was restored in the 19th century and is now designated a UNESCO World Heritage Site. Swiss artist Felice Varini employed local art students to install temporary aluminum strips, painted yellow, in circles and straight lines, accross the walls of the fortress. The result was a work of art called "Concentric, Eccentric," which debuted May 4. Though the city government called the artwork an "aesthetic experience" and a way to see the structure "in a new light," a petition to remove it has drawn 1,800 signatures. Residents of Carcassonne were not consulted about what some regard as an affront to their cultural heritage. "What will tourists think when they come to see the Cité de Carcassonne for the first and last time? What image will they have other than of a yellow safety jacket (you know, the one you put in your car! )," a comment anonymously written on the petition said. Another comment said the concentric yellow circles attached to the fortress are reminiscent of bulls'-eye targets, and inappropriate after an incident in France several weeks ago in which three people were shot dead by an Islamist gunman. Other commentators were more impressed, One said on Twitter the art installation is "playful and impressive," the Daily Telegraph reported Friday. The artwork will remain until September. "I have often met this type of reaction," Varini said. "At first there is incomprehension and then opinions change little by little."